What is spyhunter :- Spy-Hunter is a anti-malware tool alternative to Malwarebytes Published by Enigma Software. It helps to remove Malware’s and adware from a user computer. Some people thinks that it’s a virus because it shows some annoying popups to them for virus alerts or activation and sometimes it gets difficult to Uninstall. 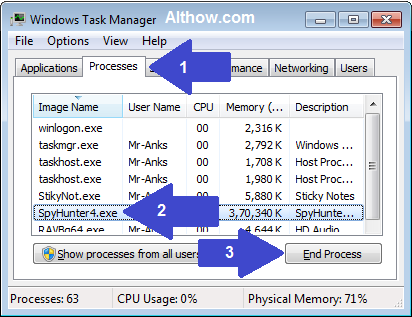 Want to know how to uninstall Spyhunter 4? If you also want to remove Spyhunter from your computer and Not able to uninstall Spyhunter 4, In this article I am going to show you How to uninstall spyhunter 4 compleatly from Windows 7, 8 or Windows 10 computer. How to Uninstall Spyhunter 4 Completely. Follow below steps to uninstall/Remove spyhunter 4 from your computer Completely. Before Starting all the processes make sure to create a system restore point, It will help you to revere any false changes made by you later if you get any error. Read below article to create a restore point. 2. Exit Spyhunter and End Spyhunter Process. Before starting Uninstallation process, You need to Exit Spyhunter and End it’s processes to prevent any error during uninstallation process. Look at the bottom right corner of your Computer screen and spot the Spyhunter logo. 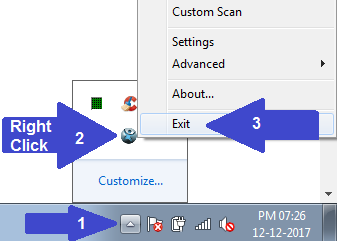 Right Click on Spyhunter logo and click Exit. Now Enter the Ctrl+Shift+Esc keys at the same time to open task manager. 3. 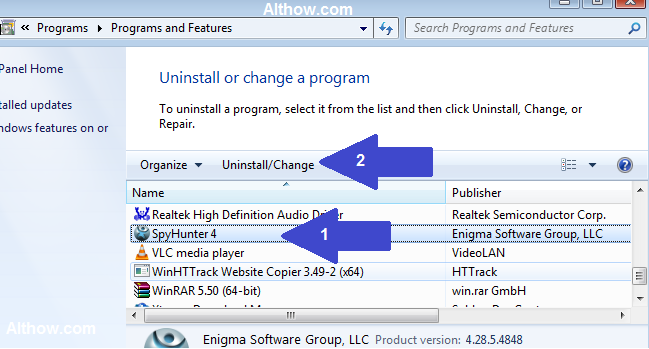 How to Uninstall Spyhunter 4 from Program and Features. Now highlight the spyhunter 4 and click Uninstall/Change. Now Follow The instructions which comes on your screen and Reboot your Computer. Most of the cases these steps are enaught to remove spyhunter 4, But in case if you see spyhunter 4 after above steps, follow the below advanced steps. Now Click Services tab, check Hide all Microsoft Services. after that if you see Spyhunter service there, uncheck it and click ok. If you See a folder named Spyhunter, Delete it. 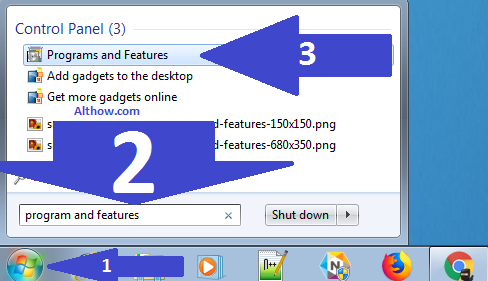 Now go to the C: drive, Click Organize on the top left corner of your Screen, then click Folder and Search Options. 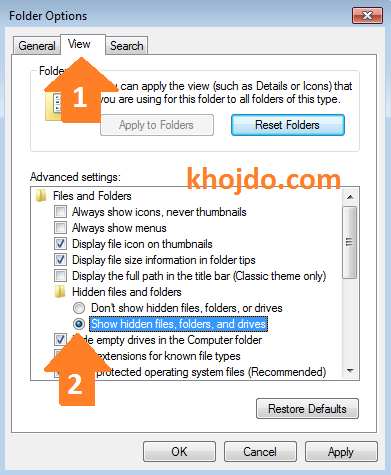 Now Folder Options window will appear, Click View tab. Scroll down and check Show hidden files folders and drices. and hit ok button. Now go to C: drive again,, Search for Spyhunter, If you receive any results results related to spyhunter, Delete them. 6. Remove Invalid keys/values in registry. After removing all spyhunter files, some spyhunter registry entries will still be thair. 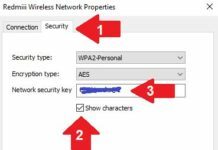 you can read my article about How to use ccleaner to remove broken registry from your computer with Ccleaner. Or follow below steps to remove them Mannualy. Enter Windows + R buttons at the same time and type Regedit.exe and hit Enter. Now Windows registry window will appear, Enter Ctrl+F buttons at the same time, type spyhunter on the search box and hit Enter. Now if you see any entry related to Spyhunter, Right click on it and click Delete. 7. Use Microsoft Fix-it Tool to remove spyhunter 4. 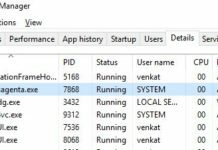 If you have tried all above steps and still not able to uninstall spyhunter 4, you can use Microsoft Fix-it tool to solve this issue. follow steps to about How to uninstall spyhunter 4 with Microsoft Fix-it. Download Microsoft Fix-it from (this link). After downloading, Open the Microsoft Fix-it setup, and Click Run Now button under Fix problems that programs cannot be installed or uninstalled. Click Yes if it asks for any authorization and click Accept in the popup window to complete Microsoft Fix-it installation. 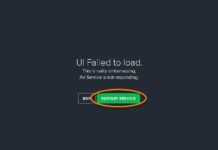 Select Detect problems and apply fixes for me. Now Click Uninstalling when it asks for the type of help you need. 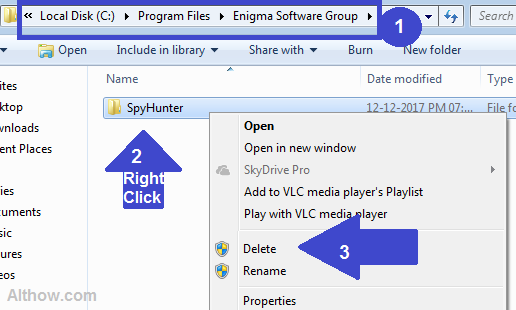 Select Spy-hunter from the list of programs and click Next button, Follow the instructions and you are done. That’s it, If you have more questions or quires about my article How to Uninstall Spyhunter 4 Completely, Feel free to Comment Below. gracias amigo, espero que me sirva ? great guide, helped me a lot, even when my system is not in english (i just translated for myself). thank you very much. the only bad thing about this guide is, that it was hard to find. i searched very long and read many useless guids before i found this one. I’m happy to hear that my friend.. I’m working to make this guide visible for more people easily..